Kitty Pryde from an alternative universe became a member of the Exiles known as "Cat". Characters with strong religious beliefs are depicted as old-fashioned, intolerant, or out of touch. What, you mean like Nightcrawler or that preacher [William Conover] in the X-men/Brood confrontation just before Inferno? No, like Reverend Craig, or the televangelist villain from "God Loves Man Kills". And despite Nightcrawler being Catholic and Kitty Jewish, when did Kurt go to confession, or Kitty light Sabbath candles? He never shows them practice any rituals, except generic ones like singing Christmas carols. Well, the point is he hasn't portrayed all religious people as intolerant, just some of them - and this just seems like an accurate reflection of society. Also he obviously doesn't show a lot of the characters religious life because 'Nightcrawler Goes To Church' would make a crap issue. But he has made their beliefs part of the story, as in Nightcrawlers soul-searching after meeting the Beyonder or Kitty's anger at the Lightning Squad in Excalibur. Do you want all religious characters to be tolerant, trendy and with-it? Now that would be soooo realistic wouldn't it? -who's folks come from Northern Ireland, so I could write you an encyclopedia on Religion and It's Intolerance. ...As to Kitty, why would other people than Christians have to be portrayed as die-hard fanatics? Christianity isn't the only religion who has the right to have people whose beliefs are less than ideal. My problem isn't with Kitty's observance (or lack thereof). In that respect she accurately reflects the bulk of the Jews in America and Canada (including Chris Claremont). But if Kitty is going to be singled out as the "Jewish X-man" then I'd like to see her do more than wear a Magen David. Other than the time she visited a Holocaust memorial with Magneto, Claremont used her Jewishness as window dressing. She isn't observant? Why not tell us why. Kurt skips confession? Make that the focus of a story. Instead we get stereotypes that are as inaccurate as any of the Anti-Mutant propaganda of Graydon Creed. Um. Can you prove that she is singled out as 'the Jewish X-Man'? I honestly don't see that being the case. She's the 'child prodigy X-Man', if you insist on categorizing her with just one trait. Other than that time, Claremont didn't use her Jewishness. He was not required to deal with her Jewishness any more than he was required to deal with, say, Roberto's Catholicism. And he didn't. Just like he didn't deal with Roberto's Catholicism. re: "My problem isn't with Kitty's observance (or lack thereof). In that respect she accurately reflects the bulk of the Jews in America..."
So on one hand you're saying that Kitty's an accurate depiction, and on the other hand you're complaining about inaccurate depiction? Is this a correct interpretation? re: "Why should Kurt's faith only matter when it is called into question?" Because it's an interesting development. Nightcrawler reading the Bible for half an hour would make a crap comic (although no worse than the current X-men/Doctor Doom Annual). re: "Why should religious people be constantly portrayed as backwards, primitive, or naive?" Erm... except for the fact that they're not. The preacher in God Loves, Man Kills is an attack on TV evangelist style religion. It plays on peoples' fears, promotes intolerance and is led by sanctimonous nutters. They exist in this world. I've seen TV Evangelists promote hatred thru self-righteousness. Some religious people ARE backwards, primitive and naive. While Nightcrawler, Kitty Pryde and the preacher in the Brood storyline [William Conover] all show religious characters that are none of the above. re: "But if Kitty is going to be singled out as the 'Jewish X-man'..."
I think the point is that she is not just the Jewish X-man. She is a complete character of which her religion is only a part. A token 'Jewish' character smacks of the religious small-mindedness you say you're against. re: "Other than the time she visited a Holocaust memorial with Magneto, Claremont used her Jewishness as window dressing"
Rubbish, and you can't back that up with any evidence. Kitty's Jewishness has been used primarily when necessary (her anger at the Lightning Squad Shadowcat) but most of the time it has no relevance to the main storyline. I never said I wanted Kitty to be the "token Jew". What I said is that her Jewishness is generally ignored, except on certain occasions when it might be useful to compare the anti-mutant sentiments to the Holocaust, or for a similar reason. If her Jewishness has no relevance to the story it shouldn't be highlighted, but why should it be ignored? She used to wear a Magen David. Why did she stop? Several of her teammates have deep religious feelings. How does that make her feel? Show us a panel here, a caption there. Be subtle. When was the last time that the X-books (or any mainstream comic for that matter) handled religion as something other than an oppressive tool used by narrow minded zealots? re: "there are bad TV evangelists out there, would you rather we pretended they don't exist." I know they exist. I also know that there are people with religious convictions who don't go around demanding that anyone who disagrees with their beliefs be demonized. re: "She [Kitty Pryde] used to wear a Magen David. Why did she stop?" Her [Kitty Pryde's] "Jewishness" is ignored because it is irrelevant to the story. If Claremont had tried to force Jewish references in, say the Shi'Ar Brood storyline, it would have stuck out a mile or be limited to horrible cliches, like Kitty saying 'Oi Vey' when surprised. It would have led to her being labeled the Jewish X-men, which is something neither of us want. I was originally complaining about Claremont's tendencies of ignoring character's religious beliefs except in major stories, and of treating certain religious characters (notably clergy) as intolerant. In hindsight, Claremont was following the comic book norms of tiptoeing around religion. However I have noticed that when he did have characters discuss religion, or express religious beliefs, he rarely used actual ritual, or organized religion. I'm not sure if that's also part of the tiptoeing or if it's for another reason. The other problem I have (which I may not have stated clearly in previous posts) has to do with Kitty's lack of religious identity. I take it as a given that Kitty is non-observant. Her parents are non-observant, and she grew up in a secular environment. However, she originally had a strong Jewish identity. She wore a Magen David, and went with Magneto to a memorial for Holocaust victims. But somewhere along the line she just stopped wearing the Magen David, and she dropped her Jewish identity like a hot potato. It started after Excalibur started, and since then she has mentioned that she is Jewish all of twice in the last three years (that I remember): Once to tell off the Uncreated, and once in a Hanukah story for a Christmas Special. At least in Finland, not all people who are nominally Christians (i.e. enrolled in the church) particularly believe in God. I'd believe the same to be true of Jews. So I'd think maybe this is true in America as well. Even if you're nominally a Jew, you don't necessarily have to have the strongest beliefs in the world. However, you are taking issue with Kitty not being a devout Jew, whereas we have for example Kurt being a very devout Catholic. Therefore, I would assume that you don't have the biggest problem with religion in general, but rather the fact that the only Jewish X-person is not particularly religious. What can I say? That's the way the cookie crumbles. Claremont made some religious people more religious, and some less religious. This is realistic. I am sorry that it ended up being Kitty who was one of the less religious ones, but I doubt Claremont intended this as any kind of a slur towards Jews. re: "However, she originally had a strong Jewish identity. She wore a Magen David, and went with Magneto to a memorial for Holocaust victims." These being just about the only two things one would know she was a Jew from. I remember when I read UXM [Uncanny X-Men] #199, I was surprised to learn that Kitty was a Jew. It had never caught my eye before. Aside from UXM #199, I think the meeting with Lightning Squad in Excalibur was the only other scene which really spotlighted the fact that she was a Jew. I really would not say that she had a 'strong' Jewish identity, when I had for years been missing the fact that she even was a Jew in the first place. re: "But somewhere along the line she just stopped wearing the Magen David, and she dropped her Jewish identity like a hot potato." The Magen David was not drawn in in every single issue up to #199, and it wasn't drawn in in every single issue after that. It might or it might not be drawn in less frequently these days, I haven't compiled statistics, but is that really such a major point? Maybe she's wearing it under her shirt or something? Just because it's not drawn hanging over her shirt doesn't mean it's not there. re: "It started after Excalibur started, and since then she has mentioned that she is Jewish all of twice in the last three years (that I remember)..."
I got to thinking about the UX-Men [Uncanny X-Men] Dracula arc oh-so-long-ago in which, if memory serves me, Kitty is able to have some power over Dracula using a Jewish symbol. This being the power of belief and conviction has over the undead. I seem to remember something from the New Mutants but I can't put my finger on it. And, there was the Nightcrawler scene in the cartoon. ...when Magneto and Kitty went to a Holocaust convention (I don't know if that's religion being used as a plot but they did discuss about being Jewish), which of course is where the then newly formed Freedom Force attacked and arrested Maggie. ...Does Kitty practice reformed Judaism? She seems pretty clearly not Orthodox or Hasidic. I couldn't say about her [Kitty Pryde's religious] practice; I'm fairly sure she believes. re: "...does Kitty practice reformed Judaism?" Actually, the correct term is "reform Judaism". Magneto and Shadowcat are both Jewish and they both attended a Holocaust memorial (although not religious it did mention religion throughout the issue). If we're thinking of the same issue, the one where Dracula goes after Storm (which oddly enough I first saw in a Dutch version), then what happened was that Kitty actually went after Dracula with a cross and he simply batted it away and grabbed her by the neck at which point he burned himself on her Star of David. Storm worships some nameless goddess. Cannonball is a Christian denomination. Shadowcat is Jewish. Not sure about the rest. Most writers take it for granted that a) characters believe in a god and b) that they're Judeo-Christian. Don't forget that X-Man Kitty Pryde is Jewish -- or she was in the 80's when I collected the title. I enjoy Religion in comics most when it's explored through the personal experience/development of a character... I thought it was neat that Kitty was Jewish... Anything that makes it personal, that respectfully approaches and explores the human experience of how the individual relates to the Divine through the traditions of their own Religion is always interesting to me! I think it's neat when any of the characters are shown to be Jewish, expecially if their Jewishness is used effectively as a plot point (such as when Kitty tried to use a cross against Dracula). When handled respectfully and appropriately, religion (of any flavor) can add a whole new level of impact and insight to comic book stories. When badly or sloppily handled, it can very easily turn into mockery of whatever point it was trying to make. I'm actully really really fond of the early - mid 90s Marvel Christmas specials. I remember some really good stories in there particularly a Spidey/JJJ one and a Shadowcat one. It's been years, but I think some of them were even better than that. It was the holiday season (Kitty probably wasn't looking forward to Christmas, since she's Jewish), and she was depressed that she wouldn't be able to see her parents, so she was sticking around in the mansion when some N'Garai demon showed up. At the end, the X-Men reveal that they left because they went to go get Kitty's folks to surprise her. The story itself, I thought, referenced Alien more than it did Home Alone, which it did indeed predate. I enjoy it when a character's faith (or lack of it) is explored. Done properly, it can enrich characterization and be a powerful dramatic tool. I recall a long ago scene in X-Men when they were fighting the Brood where the atheist Wolverine and the Christian Nightcrawler had a brief discussion about faith, and I really liked the issue from around the same period in which the X-Men were battling Dracula. Wolverine attempts to make the sign of the Cross, but it has no effect on the vampire because he isn't a believer. However, Nightcrawler's cross works, and Dracula also burns his hand on Kitty's Star of David necklace when he grabs her. Kitty Pryde a.k.a. Shadowcat is Jewish, right? Just reading the always interesting 'Fool Brittannia', where Reggie... asks about the whereabouts of characters with clearly-defined religions in comics. To his informal shortlist, I could only add (IIRC [If I recall correctly]) Kitty Pryde from 'X-Men', who is/was Jewish, and David from 'Strangers in Paradise', who is/was devoutly Christian. This got me thinking: what about Tooth? Do we have many 2000AD characters with defined 'real' religious orientations? The saddest thing is how under-represented Jews are, and their portrayal. Kitty might be the least religious Jew ever (plus I'm sure her family would love that she's going out with a guy who's grandparents probably muscled them out of Russia), Magneto is superevil. And Sabra shows up three times every twenty years. re: "Kitty might be the least religious Jew ever"
re: "Whenever Claremont writes her, she can barely shut up about being Jewish." I have to agree with this. She's one of the most outwardly religious people on the team. She talks about it, and participates in traditions like Yardzeit when she is mourning Piotr. I'd say her and Kurt are strong enough in their religion to properly represent their respective religions. She did Yertziet... Not only did I miss that, but it's completely out of place. You only do yertzeit for family members and definitely only for Jews. This would make her a very Reform Jew. I didn't know Yertziet was specific to Jews, but yeah I guess that's a plot-hole. Otherwise, I'd say Kitty considered Pitor her family. ...Speaking of X-characters though, isn't Kitty Pryde from a Jewish family? And isn't Kitty Pryde [in Ultimate X-Men a well-written and developed Jewish character? It is kind of a stupid rant to make when the person running the Marvel Universe right now (Bendis) and writting some of the stories that she is talking about, is Jewish. I mentioned Bendis' heritage in the piece. And that he's the son of a Rabbi. ...On another note, when was it established that Kitty Pryde was Jewish? re: I have a feeling that there are more Jewish, or those who have Jewish characters in the Marvel Universe. Kitty Pryde, when she first started appearing in the early issues of X-Men, wore a Jewish Star (Star of David) necklace all the time, which is a pretty clear statement that she's Jewish, though not of her religiousity. Of course, Sabra, being Israeli, has a costume that reflects her Jewishness, though that is more a nationalistic thing, than a religious one, in my opinion. Moon Knight -- his father was a rabbi. No Jewish character has ever been shown to be devout, certainly not a super hero. Problem is, most people who hear this will probably say that there's nothing much to write about a Muslim or Islamic character, but then I think of the Phantom Stranger and the Judeo-Christian references in his origin and more recently Brian K. Vaughan's Runaways that has a Judeo-Christian reference here and there. I'm not asking for a super popular Muslim superhero like Superman or Batman but at least one that has some respectabilty. Let's take Kitty Pryde for example. She's by far the most popular Jewish character in Marvel. She's not by any means an ultra-popular character, but everyone X-versed knows who she is and that she's Jewish. It's rather difficult for non-Muslims to write a Muslim character without being stereotypical. Most DC heroes from other nations and/or cultures are stereotypical. I disagree with the fact that non-Muslim writers can't write a good Muslim character though. I mean Greg Rucka isn't Jewish (to my knowledge) but he wrote a very good Judaism-themed story for Kitty Pryde in an X-Men GN [graphic novel] I read. I think its really a matter of interests... maybe we Muslims are just too boring or uptight to be portrayed in the seedy underbelly of the Superhero world? I agree with the fact that most Muslims aren't Arabs. I myself am a Malay-Indian Muslim. Hinduism isn't too widely regarded in comics either, but I guess Kama Sutra man did make Whose Line Is It Anyway? In the U.S. we have way more interaction with Jews and Judaism than we have with Muslims and Islam. Jews have been strongly integrated into mainstream U.S. society for decades while Muslims are still on the fringe. DC and Marvel staff are unlikely to have characters who simply happen to be Muslim. I think the closest is Dust and even her costume is a huge flag waving a constant reminder of her religion - unlike other members of the X-Men. I mean, Nightcrawler doesn't wear a huge cross on his costume nor does Shadowcat dislay her Star of David. The two major religions in the U.S. are Christianity and Judaism - and those two are closely linked through the Old and New Testaments. How U.S. Jews incorporate their faith into daily life is simply easier for U.S. writers to grasp. I agree with Tommy, though there are those characters whose religion is a part of what defines them and can get away with it (Kitty Pryde and Kurt Wagner for two). But I think by not saying anything, it's left up to the reader to assume who is what and I think that's more or less the best way to approach it. Oh, and Kitty Pride is Jewish, also. Forge believes in some native spiritualism thing. It doesn't seem to come up much, but religion gets mentioned from time to time. Growing up, some comic book characters' religions were obvious: Kitty Pryde was very vocal about being Jewish; Nightcrawler was a devout Catholic. But if you've ever wondered about the faith of some less obviously religious caped and cowled vigilantes, look here. ...Kitty Pride ... Bet she had a nose job like Jennifer Grey and changed her last name. Pure JAP move. ...Now would it be a Catholic or Jewish ceremony? Since it's never been stated that Peter belongs to the Russian Orthodox church, and it's been implied that he had an Atheist upbringing - we're DEFINITELY looking at a Jewish ceremony here. Peter would look great in a yarmulke! L'Chaim!! This [blogger's posted self-made illustration imagining the wedding of Colossus and Kitty Pryde] is pretty and all, but isn't Kitty Jewish and Piotr an atheist? Kitty would get married under a chuppah, or if she wanted to compromise for Piotr, they'd more likely have a civil ceremony. Just sayin'. I am admittedly a detail nut. Nice pic, Gloveman. One quibble: why the cross on the podium? Kitty's Jewish, Piotr's usually depicted as an athiest/agonstic(although sometimes I more likely suspect he's a non-demoninational deist), there should be a Star of David on the cloth. Any wedding between these two should be a traditional Jewish wedding, complete with veil over Kitty's face and Piotr breaking the glass under his heel. Well, I do know is that Shadowcat (X-Men) is Jewish and that is the only Jewish character I can think of. Oh, and Sasquatch from Alpha Flight. And Ragman is the only one I can think of in the DC Universe. ...In X-Men: Evolution... in a holiday episode Kitty "Shadowcat" Pryde is seen lighting a menorah, indicating she's Jewish. Kitty Pryde was 13 and 1/2 years old when her powers first manifested and she was contacted by both Xavier and Emma Frost, so she may have had her Bat Mitzvah by that time. I don't think that's ever been addressed in the comics. The way to get around this difficulty is to avoid the specific faith of the real icons like Superman... But I see no reason why you wouldn't empahsize the Catholocism of Nightcrawler or the Jewish faith of Kitty. It didn't repel fans of X2 in the first example. I've always thought of Superman's story as being more an allagory for the Jewish immigrant experience in America. He comes from a far away place, with a very ethnic name, Kal-El, to the heartland of America where he becomes the very WASP-y Clark Kent. He's even clothed in the colors of the American flag, minus any white. As for other religious superheroes, Kitty Pryde's a practicing Jew, isn't she? And of course Nightcrawler's a devout Catholic. 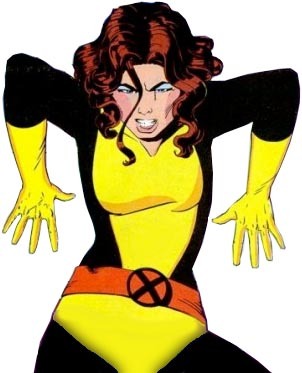 Katherine "Kitty" Pryde, a.k.a Shadowcat/ Sprite of The Uncanny X-Men, was identified as Jewish years ago. (Don't ask me how: not being a Democrat Congressperson or a Guardian columnist, I don't possess finely-tuned Jewdar capable of detecting hidden Hebrews in unexpected places). Fortunately, there are other ways of detecting these things. In this case, I believe, it was the moment when Dracula sneered at the crucifix she was wielding with insufficient conviction, went for her throat - and bounced off the Star of David pendant she was wearing with a screech of vampiric pain. One doesn't have to make these things up. There are people already being paid to do so. Shadowcat is Jewish, as is Sabra. Firebird is Christian, though I don't know which denomination. In celebration of Rosh Hashanah - which, for the benefit of my fellow goyim, begins tonight at sunset - today's Comic Art Friday celebrates heroes and heroines of the Hebrew persuasion. If you're an SSTOL regular, you've seen both of today's artworks on previous occasions, but feel welcome to enjoy them again on this New Year's Eve/Day (depending upon what time of day you read this). This first piece is a favorite from my ever-growing "Common Elements" series, featuring pairs of unrelated heroes who share some factor in common. On the left, one of the most influential creations in the history of comics: Denny Colt, a.k.a. The Spirit. On the right, the first mainstream superheroine to openly acknowledge her Jewish faith: Katherine "Kitty" Pryde, a.k.a. 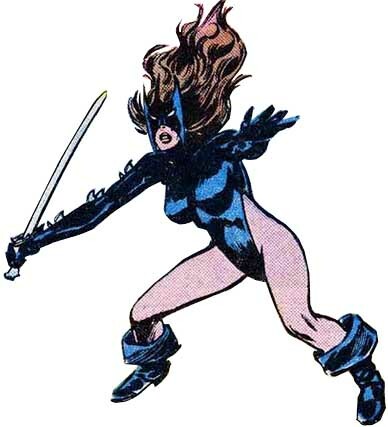 Shadowcat, of the X-Men and Excalibur. The common element I had in mind when putting Denny and Kitty together actually isn't their religion [the Spirit is not Jewish], but their code names. 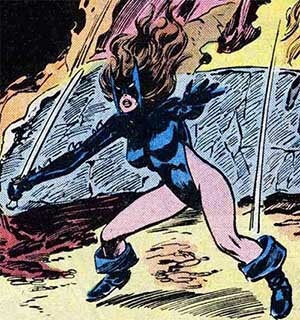 Early in her superheroic career, before settling on the Shadowcat identity (though she's often referred to in the comics simply by her real name) Kitty used the nom de guerre Sprite, which (not surprisingly) derives from the same linguistic root as Spirit. Cool site, JMarsh, thanks for linking that. Of course, I'm surprised when people say they only knew one or two, and yet no one mentioned Nightcrawler, the former Catholic Priest candidate. Kinda obvious what his denomination is. And Kitty Pryde is the most famous Super-Jew I know of. Remember when she defeated Dracula with her Jewishness? Cause I do. I remember she went totally JAPpy [Jewish American Princess] on him. Actually, thats the coolest scene ever. I so want to write that. And yet, conversely, I also want to write a story where she questions her Jewish faith and becomes a cultural Jew. No, then we have an interfaith relationship storyline. Imagine what a strong image it would be to have her throw away her incredible disappearing Star of David necklace. She's already dating someone [Colossus] who grew up in Russia - most likely without any religious background. I have to admit I smile every time I see Kitty Pryde wearing a Jewish Star pendant (and got a kick out of seeing her light a Hanukkah Menorah on an episode of X-Men Evolution). Q3. Kitty Pryde (Shadowcat) of the X-Men is one of the most overtly Jewish superheroes of all time. How does she prominently display her faith? I was thinking of Nightcrawler... Rahne Sinclair (Wolfsbane) was raised Calvinist... The Guthries (Sam, etc.) are Baptists. Clark Kent is a Methodist. Kitty Pride is a Reform Jew. Magneto is Jewish too. There's really no point to this thread, and no point for you to attempt to justify your religious based super hero. Yeah, Kitty is Jewish and Hulk may be catholic, but that's only one aspect of their character, and their character is not defined by religion like you are making it seem. ...All the comments that were made about it got me thinking... I know that Kitty Pryde from her mini series claims to be Jewish. ...the Star of David which has come to represent Judaism, is actualy six points, not five. (But that was probably just a typo), and derived from the seal of Solomon used in magic. I know that the Star of David is a six point star and it is used somewhat in magic. I think that the big star (type) that is used in magic is the five star (used in the Pentagram). Anyway, thanks again Daniel. That site [Adherents.com] has had a lot of TLC [Tender Loving Care] put into it. Someone has spent a lot of time researching this. Excalibur (vol. 1) #52 (July 1992): "All You Ever Wanted to Know About Phoenix... But Were Afraid to Ask"
Excalibur (vol. 1) #61 (Jan. 1993): "Truth and Consequence"
Excalibur (vol. 1) #88 (Aug. 1995): "Dream Nails"
Excalibur (vol. 1) #101 (Sep. 1996): "Quiet"
Excalibur (vol. 1) #102 (Oct. 1996): "After the Bomb"
Excalibur (vol. 1) #103 (Nov. 1996): "Bend Sinister Reprise"
Marvel Comics Presents (vol. 1) #34 (Late Dec. 1989): "Like a Housewife Having a Wild Weekend, Part 4"
Marvel Comics Presents (vol. 1) #35 (Mid-Nov. 1989): "Having a Wild Weekend, Part 5: A Day at the Circus"
Marvel Comics Presents (vol. 1) #36 (Dec. 1989): "Having a Wild Weekend, Part 6: Keep the Fire Burning"
Nightcrawler (vol. 1) #2 (Dec. 1985): "A Boggie Day in L'un Dun-T'wn"
X-Men (vol. 2) #93 (Oct. 1999): "Hidden Lives, Part 1: Open Wounds"
X-Men (vol. 2) #100 (May 2000): "End of Days"
X-Men (vol. 2) #101 (June 2000): "Hard Landing"
X-Men (vol. 2) #201 (Sep. 2007): "Endangered Species: Chapter Five"